Sequence of sedimentary rock layers (strata) from Lake Mead. Geologic time scale showing ages. The geologic time scale is a hypothetical chronology derived by associating particular layers of rock (strata) with periods of time and sequences of events thought to have occurred over hundreds of millions of years. The time scale was developed from the studies on the origins of the various kinds of rocks (petrology), coupled with studies of rock layering (stratigraphy) and the fossils they contain (paleontology). For example, it is believed that during a particular episode the land surface was raised in one part of the world to form high plateaus and mountain ranges. After the uplift of the land, the forces of erosion attacked the highlands and the eroded rock debris was transported and deposited in the lowlands. During the same interval of time in another part of the world, the land surface subsided and was covered by the seas. With the sinking of the land surface, sediments were deposited on the ocean floor. Such recurring events as mountain building and sea encroachment are believed to be recorded in rock layers that comprise units of geologic time. Secular geologists have divided the Earth's presumed history into Eras -- broad spans based on the general character of life that existed during these times -- and Periods -- shorter spans based partly on evidence of major disturbances of the Earth's crust. However, most creationists interpret most of the Earth's strata as having been formed by the global flood of Noah. One obvious feature of these rock layers is that they differ dramatically in content and consistency from one layer to the next. Early geologic investigators also noticed that the fossils contained in them also change conspicuously as one progresses from one layer to another. The fossil sorting and differences in rock types have been interpreted by creationists as due to a variety of mechanisms such as basic survivability due to varying environmental tolerances of organisms, the progressive nature of the Flood, which covered different habitats at different stages, and hydrological sorting. These aforementioned differences among strata have helped convince many secular geologists that a catastrophic interpretation of Earth's geology was untenable, and most now hold to a uniformitarian interpretation. Uniformitarian geologists now believe that the strata represent vast ages of time. This sequence of strata is known as the geological column. Many of the individual layers have been assigned names, which frequently describe their characteristics or locations where they were first studied. Radiometric dating has also been used to assign dates to the igneous rocks associated with each layer. What follows are the basic characterizations and supposed time spans of the alleged ages, according to evolutionists. The Cenozoic is the most recent of the geological eras, comprised of the Quaternary and the Tertiary periods. The Quaternary Period is the present period. The exact length of this period is in dispute. Many evolutionists have placed the period between 1.5 million years and 2.6 million years. The Quaternary Period can be subdivided into two epochs: the Pleistocene and the Holocene. This period is thought to include the ice age and the most climate change. It also would include the extinction of most of the prehistoric animals such as the saber-tooth cat, the woolly mammoth and others. The Tertiary period is believed to have lasted from about 2.6 to 66 million years ago. The name Tertiary was first given in about the middle of the 18th century, to a layer of sediments geologically younger than other deposits known as Primary and Secondary layers. Later the Quaternary period was added around 1830 as a fourth division. These divisions of the earth's crust seemed to be adequate for the region in which they were found and to which they were applied. But when the same system was later found in other parts of Europe and North America, it was then realized that one scheme of classification could not be applied to every system, so the names of Primary and Secondary were abandoned. The names Tertiary and Quaternary are still used. Other names also used are Palaeogene and Neogene. In the Tertiary period, so the story goes, Gondwanaland finally split completely apart, and India collided with the Eurasian plate, which formed the Himalayas. Also, the previously existing mountain ranges of North America were elevated, and other mountain ranges were formed in Europe. At the beginning of the Tertiary period, mammals replaced the reptiles as the dominant animal group. Modern types of animals such as birds, reptiles, fish and invertebrates were numerous at the beginning of the period or they appeared at the very beginning of the Tertiary period. The Cretaceous period is normally described as the last period of the dinosaurs. This period is believed by evolutionists to have lasted from about 144 to about 65 million years ago. Also during this period, two new kinds of dinosaurs, the ceratopsian and pachycepalosaurid, appeared. Paleontologists also found the most shallow fossils of many insects and many modern mammals and bird groups, and the most shallow flowering plant fossils. The breakup of the world-continent Pangaea, which began during the Jurassic period, continued into the Cretaceous period. This continued breakup led to increased regional differences between the northern and southern continents. At the end of the Cretaceous period, many types of animals and dinosaurs disappeared. Other animals that had played a secondary part in the Cretaceous period were then dominant in the next period and exist today. The Jurassic period is believed by evolutionists to have began exactly 210 million years ago and lasted for 70 million years of the Mesozoic Era. In the Jurassic period, the great plant eating dinosaurs walked the earth, eating the growths of ferns and of palm-like cycads and bennettitales. The smaller but more aggressive and vicious carnivores stalked the herbivores. The oceans contained fish, squid, coiled ammonites, the great ichthyosaurs and the long-necked plesiosaurs. The pterosaurs and the first birds were also in this period. The Jurassic period, was part of the Mesozoic Era. The Jurassic period was named after the Jura Mountains, which are situated on the border of France and Switzerland. In many different ways, the Triassic period was a time of transition. This period is said to have lasted from 248 to 206 million years ago. During this period the world continent Pangaea existed which altered global climate and ocean currents. The Triassic period ended with a large extinction of the animals that had been living then. The Triassic period was named in 1834 by German geologist Friedrich August Von Alberti. The Permian period lasted from around 290 to about 248 million years ago. This period was the last period of the Paleozoic Era. The major difference between the Paleozoic and the Mesozoic was one of the largest groups of extinctions in recorded history. This affected many groups of animals, but it mostly affected marine life. Some of the groups of sea life survived this mass extinction but they never recovered their large populations again. This cleared the way for new species of sea life. On land, a smaller extinction was going on. This extinction led to what is known as "The Age of the Dinosaurs". The plants in this age also switched over to gymnosperms instead of being Cycads. In the beginning of the Permian, the plates of the earth brought the super-continent of Pangaea together. Most of the continents came together in Pangaea; the super-continent took up much of the area between the southern and northern poles. The rest of the Earth was covered by a single ocean known as Panthalassa with a smaller ocean to the east called Tethys. The Pennsylvanian started 320 million years ago and ended 286 million years ago. During this period there were low-lying swamps and deltas that covered most of what is now Virginia and the western U.S. These conditions were perfect for the beginning of coal formation in the U.S. Some trees in standing position are found in surface mines. The trees are sometimes 30 ft. tall, suggesting a rapid burial of the tree. The age of these rocks is determined by measuring the tonstein parting in a seam. A tonstein parting is created from volcanic ash. A tonstein parting can almost always be accurately dated, according to evolutionists. When the supercontinent of Pangaea was beginning to form, newly-formed sediments pushed older sediments north. Thus, all of the "older" coal seams are in northern Virginia and all of the "younger" ones are in southern Virginia. The Mississippian period lasted from 360 to 325 million years ago. 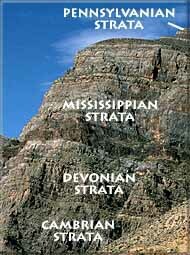 The period was named Mississippian because the rocks were first collected in Mississippi. In Europe however, they call the period the Devonian Carboniferous. In the U.S, they split it into the Mississippian and the Pennsylvanian. Rocks are classified Mississippian based on a particular group of fossils found inside them. The Devonian Period lasted from 417 to 354 million years ago. The Devonian was also called the Age of the Fishes. The two first major vascular plant life groups, the Zosterophyllophytes and Trimerophytes, were found in the Devonian. During the Devonian, groups of animals colonized the land and different types of coral and many new types of fish colonized the sea. The major landmasses in this time period were North American and Europe, which had most of its land covered by water, which were together at the time, and were near the equator. Also another continent, consisting of South America, Africa, Antarctica, India, and Australia covered the southern part of the world. The Silurian lasted from 443 to 417 million years ago. In this period the first corals and jawless fish appeared. Also in this period glacial structures melted and added to the sea. This period saw many new types of sea life and animals. The end of the period saw the first jawed fish. The rest of the period was much more stable than the other time periods before it, because it didn't have dramatic environmental changes. At the end of the period, a new super-continent was formed, called Laurussia or Euramerica. The Ordovician began about 510 Million Years ago and ended 445 million years ago. All of the earth's land was in one super-continent called Gondwana (or Gondwanaland). During this period, the super-continent shifted toward the south pole. This period also had much sea life. It is also suggested that plants occupied the land in great numbers. At the end of the Ordovician, Gondwana finally stopped its migration to the South Pole. This caused many small seas to drain and seas to shrink in size and in volume, causing a mass extinction at the end of the Ordovician. The Cambrian Period is said to be 543 to 490 million years old. The Cambrian Period is also an important point in the history of the beginning of life according to the evolutionists. The "Cambrian explosion" is so called because most of the major groups of animals appear in the fossil record in these layers, but not in lower (older) strata. The Cambrian had been considered as the rock layer that had the first fossils of animals, but some such fossils can also be found in the older Vendian strata. The geological column purports to document 543 million years of history for life and 4.5 billion years of history for the earth itself. Obviously this is inconsistent with the chronicle of history given in the Bible. But the evidence that contradicts these "ages" includes evidence from physics and from geology itself. Indeed the geological column exists nowhere in complete form, and the schema outlined above is merely an idealized representation. Indeed, many creationists caution against using any reference to geological ages as part of any investigation into the global flood or the development of the present diversity of life from the original created kinds. ↑ Lalomov AV. "Flood Geology of the Crimean Peninsula Part I: Tavrick Formation." CRSQ 38(3):118-124, December 2001. Accessed October 18, 2008. ↑ "What is the Quaternary?" Quaternary Research Association, n.d. Accessed October 18, 2008. ↑ "Tertiary Period." Pearson Education, 2008. Accessed October 18, 2008. ↑ Waggoner BM, Bui QH, Davis J, et al. "The Cretaceous Period." University of California Museum of Paleontology, May 1, 2000. Accessed October 18, 2008. ↑ Wagonner BM, Palmer AR, and Geissman J. "The Jurassic Period." University of California Museum of Paleontology, November 2002. Accessed October 18, 2008. ↑ Asaravala M, Lam H, Litty S, et al. "The Triassic Period." University of California Museum of Paleontology, May 1, 2000. Accessed October 18, 2008. ↑ The Triassic Period Enchantedlearning, 2008. Accessed October 18, 2008. ↑ Alexander C, Chang H, Tsai C, and Wu P. "The Permian." University of California Museum of Paleontology, May 11, 1998. Accessed October 18, 2008. ↑ "Pennsylvanian Period." <http://www.clearlight.com/>, n.d. Accessed October 18, 2008. ↑ Mississippian Period. <http://www.watersheds.com/>, n.d. Accessed October 18, 2008. ↑ Kazlev MA. "The Devonian Period." <http://www.palaeos.com/>, 2002. Accessed October 18, 2008. ↑ Fischer D, Lieu T, Yip E, and Yu K. "The Silurian." University of California Museum of Paleontology, May 11, 1998. Accessed October 18, 2008. ↑ Kazlev MA. "The Silurian." <http://www.palaeos.com/>, April 11, 2002. Accessed October 18, 2008. ↑ Avildsen C, Bie J, Patel C, and Sarvis B. "The Ordovician." University of California Museum of Paleontology, May 11, 1998. Accessed October 18, 2008. ↑ Kazlev MA. "The Ordovician." <http://www.palaeos.com/>, April 11, 2002. Accessed October 18, 2008. ↑ Waggoner BM and Collins AG. "The Cambrian Period." University of California Museum of Paleontology, November 22, 1994. Accessed October 18, 2008. ↑ Reed JK and Froede CR. "The Uniformitarian Stratigraphic Column: Shortcut or Pitfall for Creation Geology?" CRSQ 40(2):90-98, September 2003. Accessed October 18, 2008. This page was last modified on 26 October 2014, at 17:44.